I had a wonderful day at the Badi with ms-mac and the mac-lings on Wednesday, though I’ve realised just how unfit I am. I take my hat off to ms-mac, she is amazing, full of stamina and strength and the epitome of grace. She also has miles and miles of patience who as wonderful as they are a handful. We had a fantastic time and I came home exhausted and somewhat sore, serves me right for being so unfit! We’re going to try and keep a fixed swimming date, let’s hope I am diligent enough to get healthier! 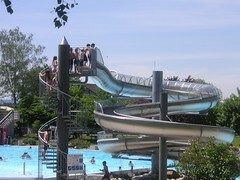 I did not venture near that slide at all, though I have been informed that ms-mac has braved it numerous times! Today I went off in search of the infamous Teddy-Summer project which has had world wide media interest and coverage (I’ve even heard about it on South African radio) I managed to photograph about 120 of the 600+ bears, though I did skip a few that didn’t quite interest me. It being such a hot summer’s day here in Zurich; had everyone out and about and the streets were full. I enjoyed most, watching little kids’ reactions to the bears – most could not resist touching them and you often saw little ones giving the bears a hug. When I could I took a picture of them, trying to avoid large(r) German women who I was convinced would pummel me! I plan to head back out tomorrow and find more bears, and will post on the subject again over the next few days. 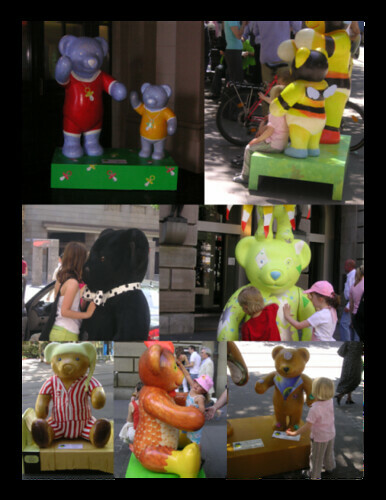 Today’s collage though, are the kids and kid themed bears. COMMENT-BODY: Hope you weren’t too sore! I had a lovely afternoon!